Whose SC Football Traditions Reign Supreme? Send us your favorite team's cheers, customs, superstitions, and tailgating traditions. We'll put them all in next month's newsletter for everyone to enjoy. May the best team win! Need ideas? Mascots, food, fight songs – everything counts! See examples of some of the customs we've received so far. The Pier at Garden City is 668 feet long. It's open from March until December, sometimes up to 24 hours a day. It regularly hosts live bands during the summer and draws many fishermen. The pier has a tackle shop as well as an arcade and a small cafe. It is an old-fashioned, laid-back place. At the end is a covered shelter where you can have a drink and listen to music on weekends. There is no fee to walk out on the pier, but you do have to buy a ticket to fish. Garden City Beach is an unincorporated community located partially in Horry County and partially in Georgetown County. Since it's only eight miles south of Myrtle Beach, it's a popular day trip for many vacationing families. Learn more about the Garden City Pier at their official site. The pier's telephone number is 843-651-9700. Many, many special thanks to Nicole Roloff for submitting the picture above. 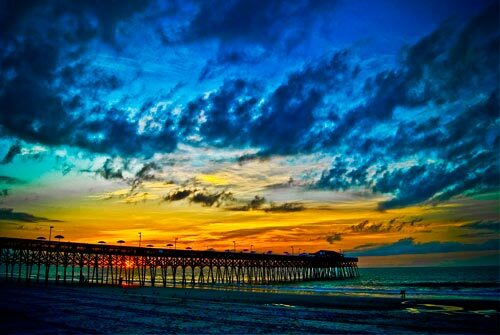 Do you have pictures from your South Carolina adventures you'd like to share? Submit your pictures to SCIWAY and the next photo of the month could be yours! The crisp, fall weather means its fair time again, and this year's fair just may be the best one yet. Find out everything you need to know including concert schedules, rides, food, shows, online ticket purchases and more! See ALL South Carolina state and county fairs here. Want to see the full calendar? Just click here to check out SCIWAY's complete calendar of October SC events! Also, remember that all our event calendars, for every month of the year, are available on SCIWAY's website 24/7/365 – just go to https://www.sciway.net/calendar.html.